Marshmallow Supernova: Is 'The Twin Dilemma' really the worst episode of Doctor Who? 'The Twin Dilemma' is the byword for irredeemable rubbish in the Doctor Who fandom. It is infamous for being awful and regularly 'wins' worst story in the Doctor Who Magazine poll. It's blamed by many for being the catalyst that killed Doctor Who in the 80s, just shortly after the show had massive success and public support during its 20th anniversary. It's seen as completely squandering any potential and goodwill, making the sixth Doctor an unlikable monster and killing Jesus. So yes. It's not really liked that much. 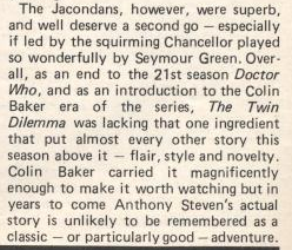 'The Twin Dilemma' was the final story of season 21, and the first story for Colin Baker's Doctor. Coming straight after the much lauded classic 'The Caves of Androzani', 'The Twin Dilemma' was always going to struggle, but a catalogue of... interesting decisions coupled with an end of season "Oh god the budget's run out" spectacular left a bad taste in the mouth. The story saw the newly regenerated Doctor go insane and try to strangle his companion, Peri. He then puts on a clown costume and spends the rest of the story alternating between violent and cowardly mood-swings. Meanwhile a man in a slug costume has kidnapped the badly lisping twins Womulus and Wemus and plans to use their mathematical genius to cover the universe in slug eggs, because that's just how he rolls. 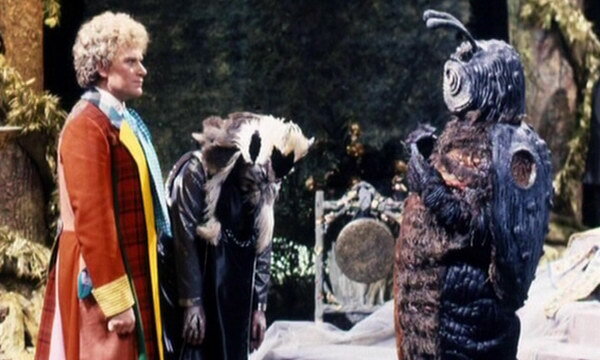 The Doctor's master plan to murder the giant slug with acid fails, and the day is saved by one of his Time Lord friends who had to sacrifice himself. The Doctor decides to keep wearing his clown costume and never apologises for trying to kill his companion. It's not... good. Not by any means. Is it really the worst story though? Not by a long shot. 'The Dominators' exists for a start. Fandom is a funny thing, and once it has decided a story is terrible, it's pretty hard to move it from that spot (now that everyone can see 'The Gunfighters', for example, it still struggles in polls despite the fact it's brilliant). Rather than talk about why other stories are worse though, I want to talk about why it's not completely terrible. There's a lot in 'The Twin Dilemma' that is pointed to as being bad ideas, but they are not bad ideas in of themselves. A while back a friend new to Classic Who watched it against my advice, and ended up really liking it. Of course, he didn't have the context of the cancellation. So what is good about it? And what isn't a bad point? They didn't like it either, but 'The Twin Dilemma' received mostly middling reviews. It wasn't seen as diabolical while airing. Context is king though. Just a year later, halfway through season 22, the BBC announced Doctor Who was to be cancelled (later rescinded to an 18 month hiatus). A few years after that in 1989, the show was cancelled for good. Fans looked about for a scapegoat and found 'The Twin Dilemma', pointing at it as the straw that broke the camels back, that it made the public hate the Doctor and turn him into an unlikable laughing stock. The show was never coming back, and it was 'The Twin Dilemma' that poisoned the well. Only, that's not true. If 'The Twin Dilemma' really chased away the audience, why did 9 million people tune into the season 22 opener 'Attack of the Cybermen', more than three million more than watched the end of 'The Twin Dilemma' that closed out season 21. Yes, it was broadcast on a different day but if 'The Twin Dilemma' really was a mortal blow, having the audience increased by 50% for the next story is an interesting definition of 'mortal blow'. If the show had never had the blow of the hiatus, 'The Twin Dilemma' would probably have a low-but-not-terrible reputation akin to that of 'Robot', Tom Baker's first story which was similarly a bit rubbish but nowhere near terrible. 'The Twin Dilemma' heralded the appearance of the sixth Doctor's horrible coat. Yes, it is horrible. I defy anyone to like it on first sight. It has its fans, but these are people who have grown to love it as a sort of Stockholm Syndrome. The in-universe explanation of "Well, the Doctor is an alien so has alien tastes so it makes perfect sense" falls down once you remember you're watching a television show aimed at actual human beings, and the writers can justify anything they want but it doesn't mean it's a good idea. It would be equally valid to have the Doctor dress up as a ballarina and claim it is a Time Lord custom, but don't expect anyone to like it. That said, this is the one story where the coat actually works. 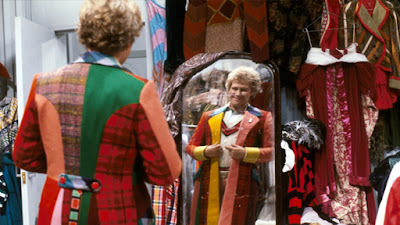 The entire story is about the Doctor being unstable, and what better way to show that than wearing a crazy clown coat? The mistake was keeping the coat around for the rest of Colin Baker's tenure. The coat should have been discarded at the end of the story to show that the Doctor was recovered and properly the Doctor again, or at least vanished between seasons. 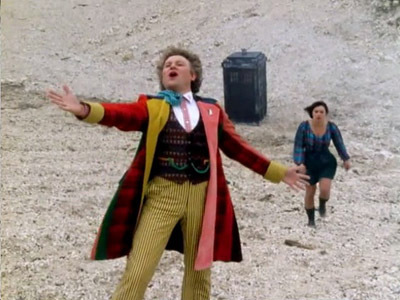 By keeping it, it gave the impression that the sixth Doctor was still this psychotic madman who randomly attacked his companions. If the coat had just been in this one story, I can guarantee people would love it, and point to it as one of the story's highlights. 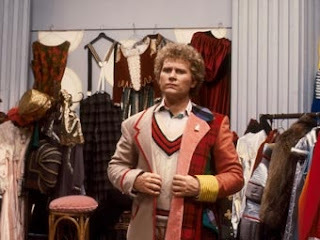 There would probably be a subset of fandom who would grumble that the coat hadn't been worn throughout the sixth Doctor's tenure. But all this isn't The Twin Dilemma's fault, it's the fault of the stories that came afterwards. As an aside, the coat also works well in 'Time and the Rani', the seventh Doctor's first story. There, he does actually discard it once he's stopped being crazy and started being the Doctor. "But it's horrible and crass!" I hear you cry. No, wait! Yes, it is pretty badly done, but the very fact they went the route of a genuinely unstable Doctor is a positive. The scene where the Doctor strangles Peri is pretty horrible to watch, but that's part of the point. The usually reliable Phil Sandifer attempts to argue on his blog that his attack is male-on-female abuse, and that Peri's forgiving of him is equivilant to "a battered woman idolizing her abuser" and criticises the show for making the Doctor the hero. That is a reading that can only really be reached by completely ignoring what's actually happening in the story. The eighties were not a time for subtlety - the story is clearly about the Doctor having mental health issues. That's not just the subtext, it's the text. He's ill. It's stated again and again. That's a very different dynamic than 'abusive partner' and not every act of male-on-female violence is directly a feminist issue and claiming it is is unhelpful. This issue is a mental health one. There's still a massive stigma around mental health in today's society, but it was even worse in the eighties. Admitting you had problems would result in you being labelled a 'nutcase' or 'lunatic' or 'psychopath' and deemed as someone to be avoided and unfit to take part in society. If you'd spent time in an institution for treatment then even if you were completely recovered that stigma would be with you forever and you'd be lucky to ever find work again. I feel in many ways it is genuinely a positive move to have a much beloved character fall prey to an episode of mental illness - and not a television friendly one, but one that includes actual harm to others - and then show him recover and that he can still be a hero. That sort of public consciousness raising is the sort of thing Doctor Who should be doing. Yes, it was slightly fumbled, but at the end of the day, the entire audience for 'The Twin Dilemma' (plus three million more) still came back for the next story. It's perhaps slightly damning though that the sixth Doctor does indeed continue to carry around the stigma of being unstable and violent, despite none of the subsequent stories really showing him doing anything out of the norm. Again, I blame the coat. Mestor is a man wearing a slightly goofy slug costume, but to condemn him on the grounds that he looks rubbish is to pretty much declare all of Doctor Who null and void. Doctor Who was always more about the ideas, with what we see on screen visual placeholders with which to explore those ideas. At least, that's always been my excuse. People like to laugh about "giant slugs" but a giant evil slug is actually a good idea. Everyone knows what a slug is, and we're all absolutely repulsed by them. One of my earliest memories is having nightmares thanks to a text story in a Ghostbusters comic about a malevolant giant slug with glowing red eyes, creeping out of the darkness. Slugs are strange and feel horrifically alien. Mestor himself is so horrific that he is even able to subjugate Time Lords. He has scary unknowable mental powers that echo how scary and unknowable slugs are. His voice acting is great. If there's a problem it's with the uninspired direction. The director is not afraid to shoot Mestor straight on, fully lit in all his dorky wobbly glory. 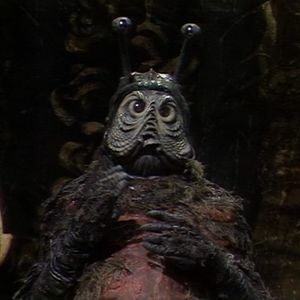 This is the same season with the Gravis, who was a man in a woodlouse costume with boggly eyes and hilariously flappy hands, but the director of 'Frontios' chose to shoot him in closeup as much as possible to disguise this fact and as a result a lot of people point to the Gravis as an effective monster. 'Caves of Androzani' had two awful monsters in the Magma Beast and the Queen Bat. The director solved this by pumping in as much smoke as possible and turning all the lights off. Most fans don't even realise there was a queen bat costume. Yes, there was. Yes, it looked horrible. There was sadly lots of better ways they could have done Mestor. He could have been a massive creature which we only saw part of, like the Malus from the same season's 'The Awakening'. 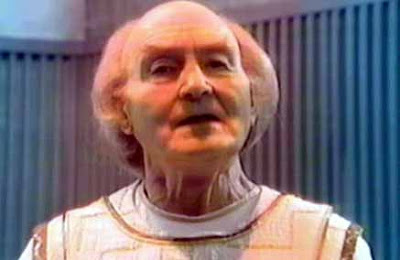 He could have been some gunge-covered shapeless mass that quivered in his throne (the lack of gunge on Mestor was especially odd as the Doctor Who production team loved gunge at the time). Even with the 'man in a fancy dress slug costume' they went with, a sympathetic director could have made it work. Again though, it's important to stress that Doctor Who has never been about the spectacle of its effects, but about the ideas that they represent. Mestor is for the most part an effective villain. His power of taking over minds and burning them out is scary, he can destroy space fleets with his mind and he can humble Time Lords. The dynamic is also well-done, with Mestor skulking in his throne room for most of the story as a terrifying presence that the Doctor must confront, rather than wobbling about in any sort of ill-advised chase scenes. Until the very end, Mestor is in total, confident control of events. Hugo's great! 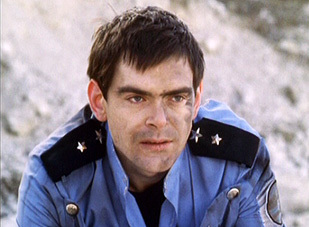 It helps that he's played by Kevin McNally who would later be Captain Jack's buddy in the Pirates of the Carribean movies. Yes, Hugo comes across as a bit of a jerk, but that's his character. Script editor Eric Saward (who ended up writing most of this story) had great fun lampooning Hugo in his novelisation. Really, it's a crime that Hugo wasn't kept on as a regular. The sixth Doctor era badly needed a more energetic and confident 'action' character to play off against the Doctor, and it's no coincidence that pretty much each episode of season 22 includes a companion substitute character who fulfils that role. It could have been Hugo! It's always nice to see Time Lords pop up, and Azmael is a particularly interesting one. He's not a moustache-twirling villain; instead he is one of the Doctor's oldest friends, forced into the role of villain. It not only helps to raise the stakes but shows the audience into more of the Doctor's character. The moment at the end between the Doctor and a dying Azmael are genuinely touching, and it's a shame that it was the Doctor's earlier madness, not this, that people took away from the story. 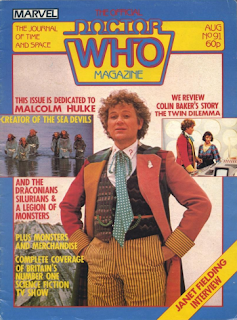 Lest we not forget Colin Baker in this story. He's absolutely brilliant in it. Perhaps that is part of the reason fans had a negative reaction, as he plays the sections where he has psychotic episodes with such menace and gusto that it leaves such an impression. There's a great energy to the rest of his performance though as he lounges on bits of the set that he's clearly not meant to, leaps about and gestures, a far cry from the much more restrained fifth Doctor. He's fun to watch - when he's not trying to kill Peri, that is! I would rather a failed experiment than a successful attempt at playing it safe. Doctor Who has often been accused of playing it safe with various bases under siege, so it feels rather rude to then criticise it when it tries something genuinely new and fails. Yes, in this case it didn't entirely work, but there is value in a failed experiment. There are other stories, just as risky, which were experiments and lauded as some of the best ever made, such as 'The Mind Robber' and 'Warrior's Gate'. Should these stories not have been made so the production team could play it safe? It's easy in hindsight to judge what does and does not work, but it's impossible to judge the success of a story just on the script alone. If that was the case, Paradise Towers would be a classic! A television production is a combination of script, set, design, costume, actors and direction. It just happened in this case, 'The Twin Dilemma' got a poor pick. I am sure there is a parallel universe somewhere where this story got the same care and attention in every aspect of its production as 'The Caves of Androzani' did. This isn't to say there aren't problems with 'The Twin Dilemma'. Far from it. But there's not as massive and insurmountable as fandom would have you believe. It's not nearly the worst story, and as a bonus it was actually trying hard to do something different for once. Surely that's worth something. If you want a good version of 'The Twin Dilemma', the novelisation is worth checking out. It's completely different, which is a bonus as well. An audiobook version was released in 2012 read by Colin Baker. There's also a nice fan-script rewrite that's been making the rounds here.